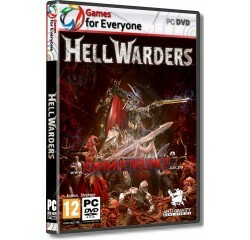 Hell Warders - R120,00 : Game Hunt, Where we lead, others follow. ACTION RPG MEETS TOWER DEFENSE - Control powerful Heroes, unleash devastating abilities and deploy strategic defensive units in this brand new sub-genre title. CREATE YOUR DEFENSES - Set up archers, knights, mages and catapults - choose their position, upgrade their abilities and create the strongest resistance possible. 4 PLAYER CO-OP - Combine forces with up to four players and battle the legions of evil! Hell Warders supports co-operative play with friends and online matchmaking. CLASS-BASED HEROES - Choose from three diverse heroes - each with their own unique weapons, skills and abilities. AN UPGRADE-ABLE ARMORY - Completing stages rewards you with beacons which upgrades your skills and unlocks powerful artifacts allowing you to stand toe to toe with even the toughest of demons. EPIC ENCOUNTERS - Battle demonic monsters, from the small and numerous to the epic and towering. Every resident of Hell is out to stop you!" Processor - Intel Core i3 or AMD Phenom X3 8650® or equivalent AMD® processor.